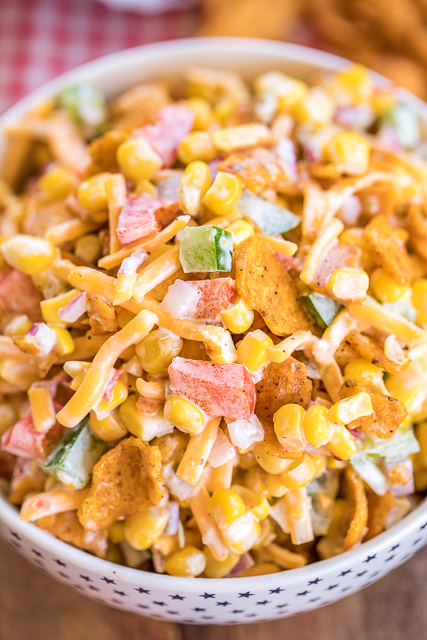 Frito Corn Salad - packed full of great flavor! We could not stop eating it! Corn, bell peppers, onion, cheese tossed in mayonnaise, lime juice, vinegar and Chili Cheese Fritos. Great as a side dish or an appetizer. Can make ahead and refrigerate until ready to serve. Everyone LOVES this easy side dish. I never have any leftovers! This Frito Corn Salad was a HUGE hit in our house! I mean, how could it not be? Corn salad with Chili Cheese Fritos? Hello?!?! This Frito Corn Salad is packed full of great flavor! We could not stop eating it! Corn, bell peppers, onion, cheese tossed in mayonnaise, lime juice, vinegar and Chili Cheese Fritos. YUM! We served this Frito Corn Salad as a side dish with some burgers, but it could also be served as an appetizer. You can make this ahead of time and refrigerate until you are ready to serve. I would suggest not adding the Fritos until right before serving the salad so they don't get soggy. 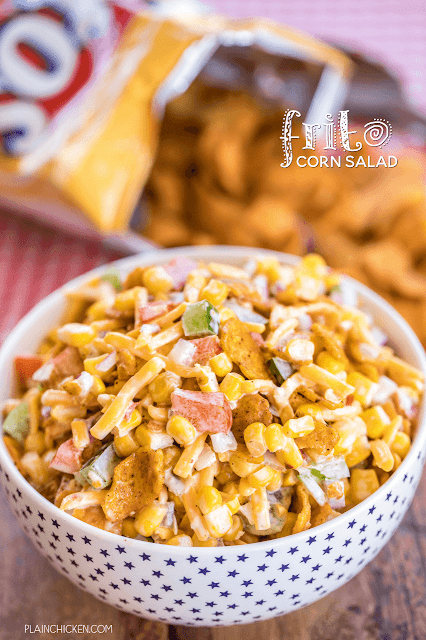 This Frito Corn Salad is super easy to make and is always a hit. The hardest part about making this recipe was having the self control to not eat all of the Chili Cheese Fritos straight out of the bag! Seriously! Combine all corn, peppers, onion, cheese, mayonnaise, lime juice and vinegar. Stir well. Stir in crushed Fritos right before serving. This sounds SO good, Stephanie. Chili-cheese Fritos are one of my weaknesses, so I am absolutely going to have to try this! Printing it now, going to make it tonight. What's not to love about this. Thanks Steph! War Eagle from Guntersville! I finally got around to making this and it is delicious! This could be tweaked with some of your favorite veggies with alittle more sauce! Thanks Steph, I love your blog and am your favorite follower. I made this tonight and it was delicious! Definitely a crowd pleaser and a dish I plan to bring to bbqs and potlucks this summer. I also feel like there is a possibility for this recipe to be tweaked just a bit for a hot dip! Thank you for sharing!